Mick McCarthy has warned the Republic of Ireland must respect Gibraltar, despite their lowly world ranking, when they meet on Saturday. 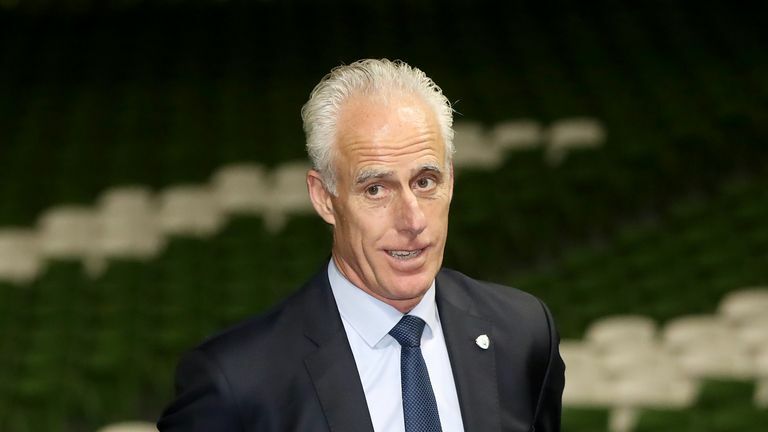 Ireland's game at the Victoria Stadium in Gibraltar - live on Sky Sports ­- is the first of McCarthy's second reign as manager following his reappointment in November. Gibraltar are ranked 194th in the world by FIFA - 160 places below Ireland - but McCarthy says they must be taken seriously if Ireland want to begin their European Qualifiers with a win. He said: "I've just been watching them and I know what strengths they've got. I'm hoping they've got some weaknesses. "I respect the opposition, whoever we're playing. We have to be really on the top of our game and make sure we do everything properly. "I saw a really committed team. They've got games now at home, which is vitally important. They'll have a huge sense of pride. "They're extremely well organised and there's some good technical players in there. They're a capable team." McCarthy also paid tribute to Jonathan Walters, the 35-year-old forward who announced his retirement from playing on Friday. The Burnley player earned 54 caps for Ireland but was forced to end his career due to an Achilles injury. McCarthy said: "It's sad to see him go but it happens to all of us. He was an inspirational player for Ireland and it's sad when you lose those players. "It's even sadder still that it's injury. He's not just decided to pack in because he thinks he can't compete at the level. I wish him well in whatever he chooses to do." Seamus Coleman - who McCarthy confirmed would continue as Ireland captain - added: "He came in yesterday and let a few of us know. "He's been nothing short of an example to all of us. The pride every time he plays for his country has been inspirational. People like him will be massively missed."